Bloody Mary’s have enjoyed an explosion of popularity in the United States since the turn of the twenty-first century. Certain regions of the country boast elaborate bloody Mary brunch bars with all manner of mixes and garnish. Speaking of garnishes, the midwest seems to be in a contest with itself to create the most over-the-top bloody Mary, with garnishes towering over the drink. What most folks in the United States think of as a bloody Mary is roughly, a mix of tomato juice, vodka, Worcestershire, celery salt, and a little spice. While some have ventured into using other spirits and/or adding their own spin to the cocktail, it’s primarily known as a vodka and tomato juice beverage served with breakfast or brunch. St. Regis Cole Bar. Birth of the American Bloody Mary? Many people believe that the first of these delicious daytime beverages was served at the St. Regis Hotel in New York City. Indeed most credit the hotel as the birthplace of the bloody Mary. 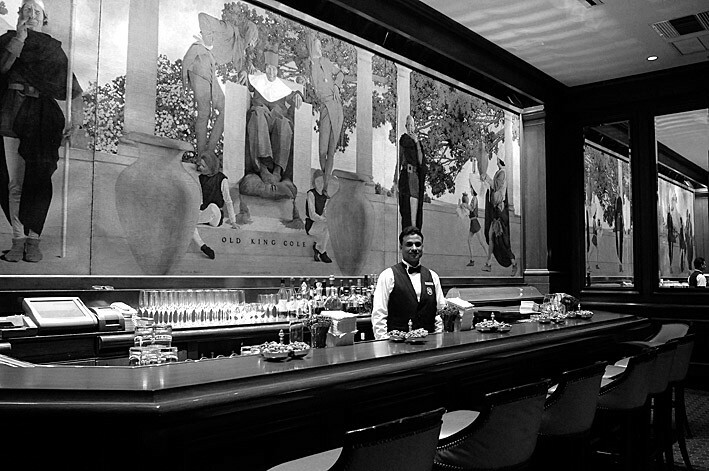 According to the hotel, In 1934, Fernand Petiot, who was the head bartender at The St. Regis’ Bar the King Cole, perfected the recipe for a vodka and tomato juice cocktail he called the Bloody Mary. Deemed too racy a name for the hotel, it was renamed the Red Snapper. The drink was small and potent like a martini, and served neat. Many believe the primary function of the drink was to disguise the consumption of alcohol at early hours. But before Fernand Petiot lived and worked in New York City, he was a bartender in Paris, at a place called, The New York Bar. Many remember that Ernest Hemingway frequented the New York Bar in Paris and later published a bloody Mary recipe in the New Yorker. This was perhaps the beginning of the bloody boom in the U.S. In characteristic Hemingway bravado, the recipe was not for a small hand crafted cocktail, but for an entire pitcher. “Anything less is worthless.” Fast forward to a modern tailgating party outside of a sporting event and you would find many who agree. It’s likely that the bloody Mary was served in France before coming to America. But even earlier than this, there is evidence of tomato juice and gin being served as an eye-opener, or brunch cocktail in England. It is perhaps ironic, or at least interesting that a modern-day version of the bloody Mary mixed with gin is called the Red Snapper. In today’s renaissance of the morning cocktail, the sky appears to be the limit. WHile purists may cringe at the deviation from the very basic, others rejoice at the possibilities of this, the most complex of cocktails. From switching out vodka for whiskey or tequila, to infusing vodka with herbs or peppers, Americans are finding new ways to enjoy an old drink. Knowing the history of the bloody Mary gives us an appreciation of the drink, but more importantly, a license to experiment. Peruse the site and try some the recipes shared here or share your own. The only rule is, there are no rules.